When justice is denied, when poverty is enforced, when ignorance prevails, and when any one class is made to feel that society is an organized conspiracy to oppress, rob and degrade them, neither the persons nor the property will be safe. All that is valuable in human society depends upon the opportunity for development accorded to the individuals of the society. Our society must make it right and possible for SAP – Specially Abled People (Physically and/or Mentally challenged people) not to fear the normal people or be deserted by them, because the test of a civilization is in the way in which it cares for its SAP members. A truly inclusive society is the answer to many of our problems and it is the only way forward. We think the first duty of a society is to bring justice and provide equal opportunity to all of its members, irrespective of their physical or mental status. Yes, we dream for a completely SAP friendly Bharat, where every SAP is educated, employed, living with dignity and is the equal or in some cases a better contributor to the development of our great nation. But, the dreams can become reality only when it is followed with the right strategy and actions. So we thought of creating a template, Model District for SAP, which can lead the socio-economical change for the SAPs all over the country. Lord Krishna’s “Karma Bhoomi”, has all the necessary ingredients which can help it to become a leader of “Inclusive Bharat”, “Accessible Bharat”, “Educated Bharat”, “Employed Bharat”, “Empowered Bharat”!! 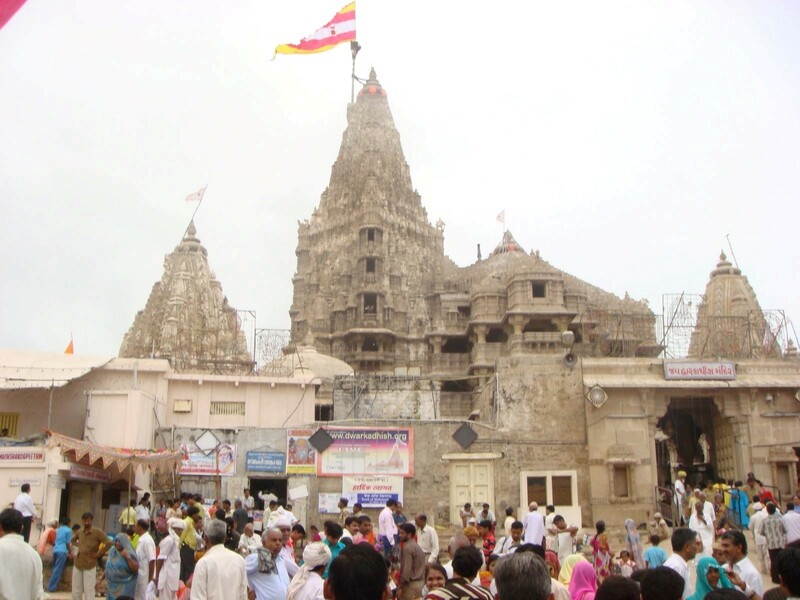 We are talking about Dev Bhoomi Dwarka, the leader of the history of the Golden Bharat. So, we decided to make a proper strategy in form of a “Sankalp Patra” to make Dev Bhoomi Dwarka District a Model District for SAP. The gods were not happy with the precious gems obtained from the milky ocean. They were not afraid of the deadly poison. They did not rest until they obtained the nectar of immortality. In fact, the steadfast do not relax without accomplishing the determined task. 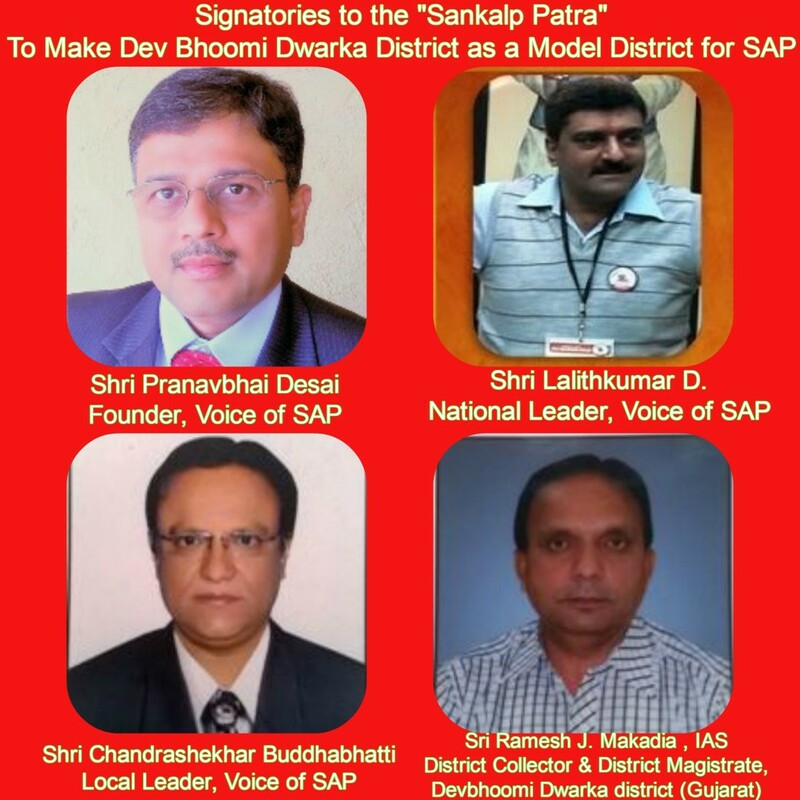 Volunteers of Voice of SAP have started working on various initiatives at “Dev Bhoomi Dwarka” District. Voice of SAP’s local leader Shri Chandrashekhar Buddhbhatti, national leader Shri Lalithkumar Gujarati and the District Collector of Dev Bhoomi Dwarka, Shri R.J.Makadia have prepared a 36 point “Sankalp Patra” with guidance and endorsement of Shri Pranavbhai Desai. In next couple of months, it is expected to get wider acceptance and refinement by elected leaders of the district such as H’ble MP Smt Poonamben Madam, local MLAs, Head of District, local industries (CSR funds) and other stakeholders to make Dev Bhoomi Dwarka, a model district for others to follow its template. 36. Form a moderating committee comprising members from Voice of SAP, Local disabled people, and DC and/or any representations from government.